I am going to first make a blank canvas that is exactly the size of the top of the quilt. For this design I chose one yard of sateen fabric, which is 56 x 36 inches, so I chose File -> New and set it to 56 x 36 inches at 150 dpi or 8400 x 5400 pixels. Choose a color for the background of your design. I picked a cool grey (#A09F9E) because I felt it made my rainbow blocks really pop. I like to use the Spoonflower Color Map to pick a color because I will know exactly what it looks like when it’s printed. I keep my color map folded up in the drawer of my computer desk. Coordinating. Think about the colors in your design and pick something that relates, like a darker or lighter shade of one of the colors in your theme. If you have all blues and greens in your design, icy blue, navy or deep green might make a great background. Contrast. Try pairing a neutral with brights. I chose grey to make my bright rainbow patches really pop. If you have neutral colored photos (like black and whites) then you might pick a vibrant background color. Illustrator: Draw a rectangle that fills the entire canvas and set the fill color to the color you have chosen. 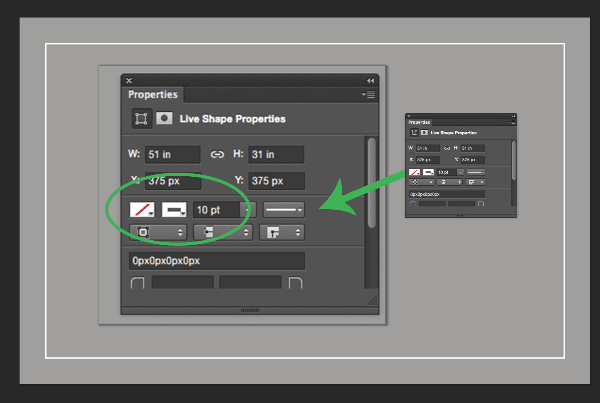 Photoshop: Make a new layer and choose Edit -> Select All. Then choose your color and Edit -> Fill. Turn on grids and rulers. I like to turn on a couple of tools to help with layout. If you don’t already have them active, you can turn on rulers which will add measurements all along the sides of your canvas. Additionally, you can turn on grid view which will lay a grid of evenly spaced lines (like graph paper) over your image. These won’t print out or show on your final saved document, but they will help you line everything up as you are working. Illustrator: Go to View -> Rulers -> Show Rulers. Then go to View -> Show Grid. 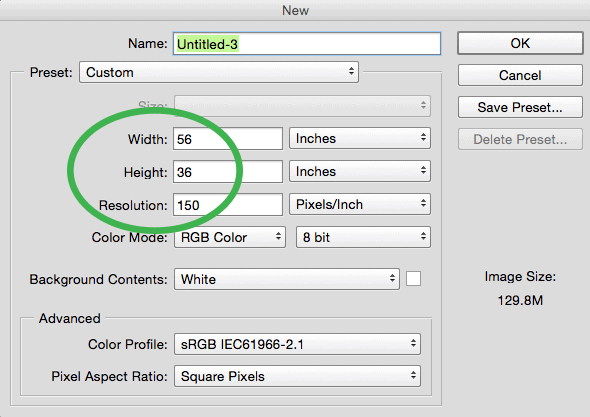 You can adjust the spacing on the grid under Illustrator -> Preferences. I like to have lines every 1 inch. 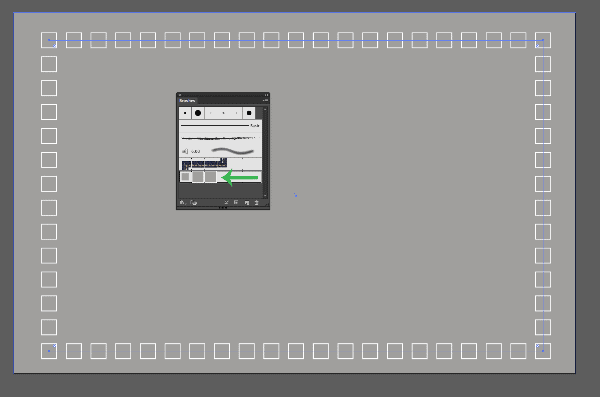 Photoshop: Go to View -> Rulers to turn on the rulers. Go to View -> Show -> Grid to turn on the grid. 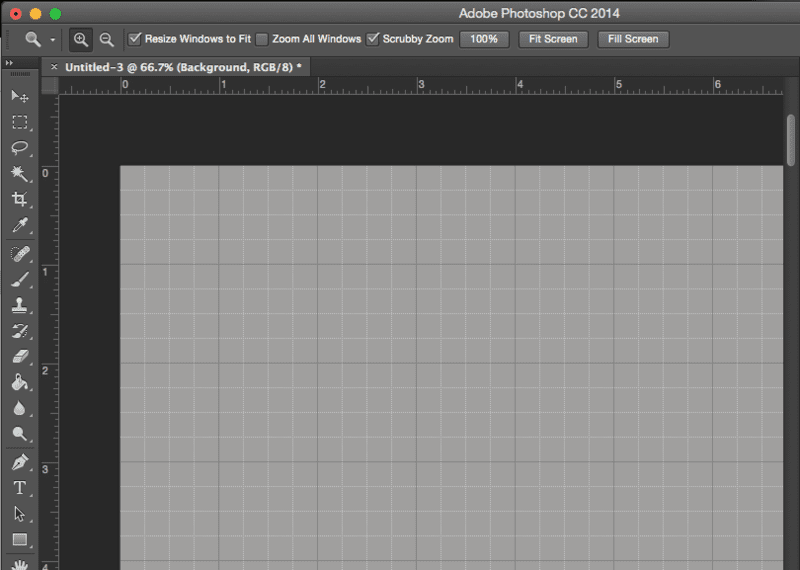 You can adjust the spacing on the grid under Photoshop -> Preferences. I like to have lines every 1 inch. For my design, I added a white border of small squares. This is the only step where it will matter a bit if you are using Photoshop or Illustrator; the design will be slightly different. Illustrator: I am going to create a really simple custom brush to make the border squares design. Anywhere on the canvas, draw a small square (1.5 x 1.5 inches) using the square tool. Fill it with the same grey as your background and outline it in white. Select the square and drag it onto the brushes palette. A “New Brush” window will pop up. 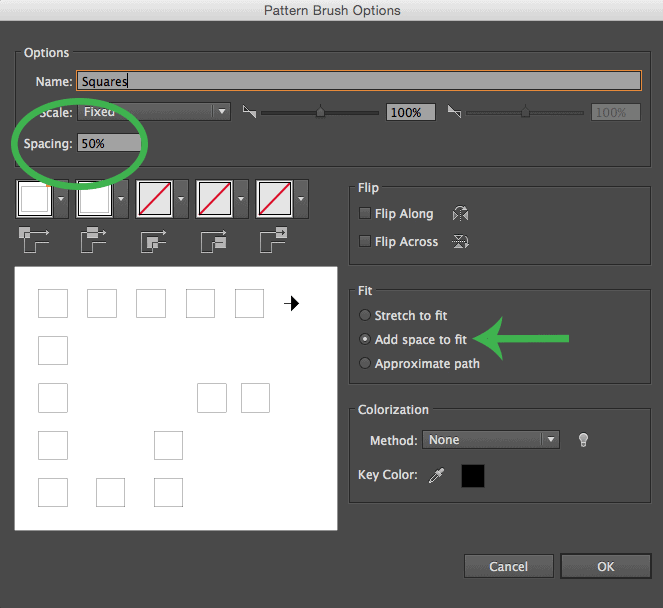 Choose “Pattern Brush” from the options. To add this border to the design, draw a new rectangle that is 51 x 31 inches and center it in the canvas. 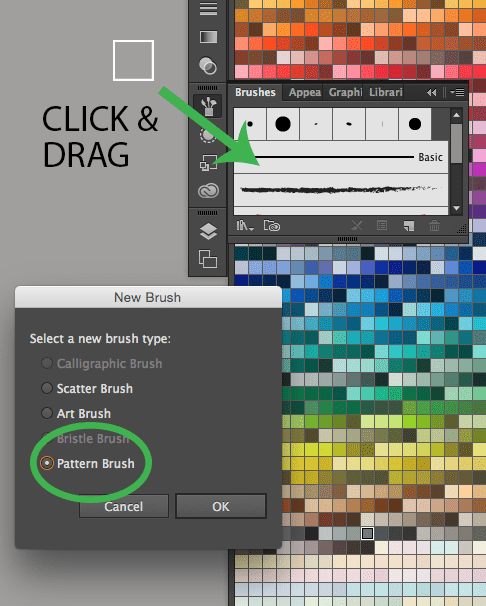 With this new rectangle selected, click on your new custom brush from the Brushes palette. It should outline the new large rectangle with a chain of squares. Photoshop: Unfortunately, Photoshop works with custom brushes differently and it is harder to make a border like we did in Illustrator. Instead we will draw just a simple frame. Use the rectangle tool to make a rectangle that is 51 x 31 inches, centered in the canvas. Then go to Window -> Properties to adjust the fill and outline color of this shape and the thickness of the outline. Save your file. Use the “native” file type for the program you are using. 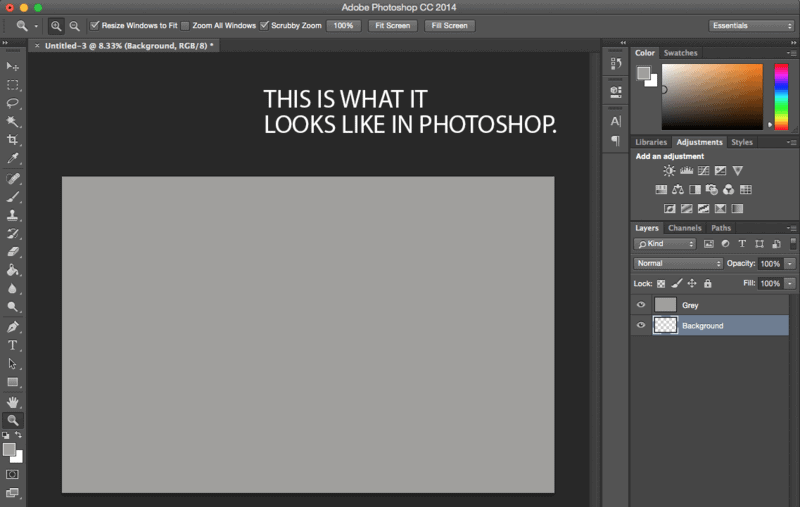 For Illustrator that is .ai and for Photoshop .psd. Usually it will default to this type. This format will save all of the layers, grids and allow us to continue to adjust the file in the next lesson. You will need a .jpg before you print the design, but you don’t want to save it that way at this step. We will add the patchwork blocks in the next lesson and get it ready to print. Show us a screenshot. How did you choose your background color? What kind of border did you design? Share your progress by using hashtag #SpoonChallenge on your social media outlet of choice!